It is a DC3.50-30.0V digital voltmeter,DC3.50-30.0V Powered,Refresh rate: about 1s / times,3-digit 0.. It is a Flashing Alarm Yellow Digital Voltmeter,Power Supply DC7-25v,Measuring Range DC 0-30V,White..
0.36" 4 Digit Ultra Small digital Voltage meter. car motorcycle battery 12V 24V power monitor. Comes.. It is Three Wires Red/Blue/Green LED DC Digital voltmeter ,Measurement range DC 0-33.00V, It has Rev..
DC 0-30V Red/Blue/Yellow/Green LED Digital voltmeter. Small dimension, wide voltage range for Measur.. 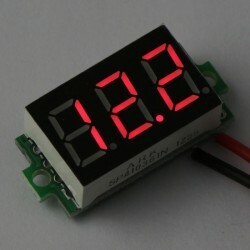 It is a 0.36" Ultra-small two-wire Red/Blue/Green LED Digital Voltmeter, Measuring range DC 2.50-32..